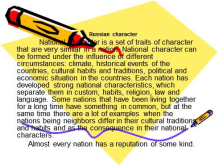 National character is a set of traits of character that are very similar in a nation. National character can be formed under the influence of different circumstances: climate, historical events of the countries, cultural habits and traditions, political and economic situation in the countries. Each nation has developed strong national characteristics, which separate them in custom, habits, religion, law and language. 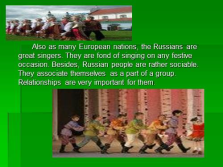 Some nations that have been living together for a long time have something in common, but at the same time there are a lot of examples when the nations being neighbors differ in their cultural traditions and habits and as the consequence in their national characters. Almost every nation has a reputation of some kind. 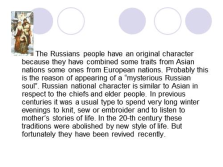 The Russians people have an original character because they have combined some traits from Asian nations some ones from European nations. 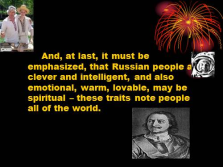 Probably this is the reason of appearing of a “mysterious Russian soul”. 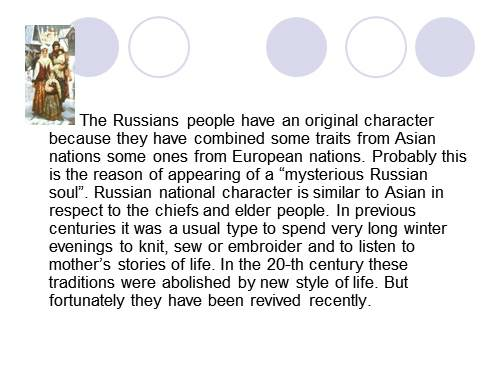 Russian national character is similar to Asian in respect to the chiefs and elder people. In previous centuries it was a usual type to spend very long winter evenings to knit, sew or embroider and to listen to mother’s stories of life. In the 20-th century these traditions were abolished by new style of life. But fortunately they have been revived recently. 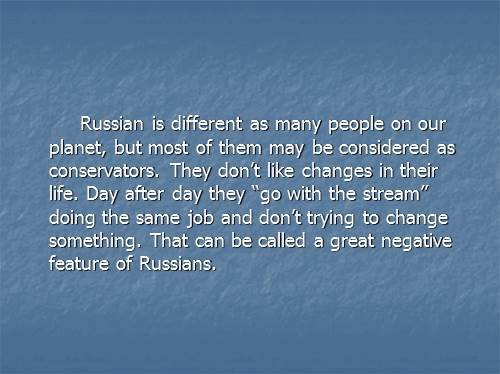 Russian is different as many people on our planet, but most of them may be considered as conservators. They don’t like changes in their life. Day after day they “go with the stream” doing the same job and don’t trying to change something. 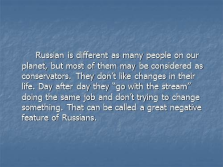 That can be called a great negative feature of Russians. It’s say that the Russians are rather lazy, but when they need very much they can work extremely hard from the dawn till sunset. But I disagree with it. 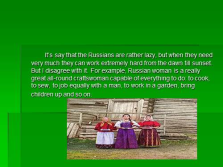 For example, Russian woman is a really great all-round craftswoman capable of everything to do: to cook, to sew, to job equally with a man, to work in a garden, bring children up and so on. 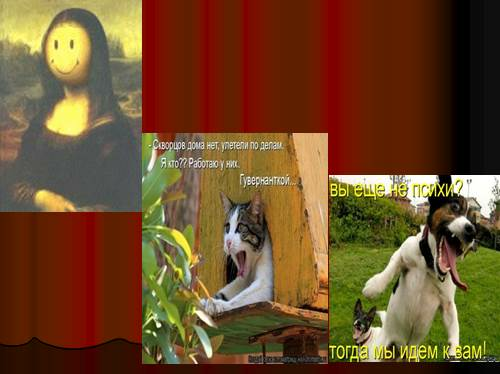 It is not secret, that Russian people are very hospitable and generous to their quests. You can come to a Russian family without any notice and you will be fed for sure because national tradition demands it. When it’s a holiday the table is full of different tasty national dishes. 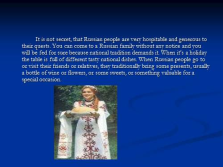 When Russian people go to or visit their friends or relatives, they traditionally bring some presents, usually a bottle of wine or flowers, or some sweets, or something valuable for a special occasion. Also as many European nations, the Russians are great singers. They are fond of singing on any festive occasion. Besides, Russian people are rather sociable. They associate themselves as a part of a group. Relationships are very important for them. And, at last, it must be emphasized, that Russian people are clever and intelligent, and also emotional, warm, lovable, may be spiritual – these traits note people all of the world.